As everyone is aware, this Monday marks the 5 year anniversary of September 11, 2001. Because of the efforts of a man named Dale Roe, thousands of bloggers are, over this weekend, posting tributes to each and every unfortunate victim of that tragic day. When I first heard about this opportunity last June to honor a victim, I instantly knew I wanted to participate. That day I signed up and was issued Denease's name. That same day I also began to learn about someone who I had no previous connection with, someone who I would later come to respect deeply. Here then is what I learned about one very brave and special woman. One woman who gave her life to save others. One woman who deserves to be remembered on this anniversary memorial day. Denny was only 44 years old when the World Trade Center tower she was working in collapsed, the same age I was earlier this year when I was given her name to honor. Denny lived in New York City and worked as a security officer for Summit Security Services, a company that provides security protection services for such high profile clients as NBC, the US Tennis Open and, until 9/11, the World Trade Center. The seeds of Denease Conley's toughness could be seen early on. She once had a fight with an older sister who locked herself in the bathroom, and to get her out, Denny, as she was known, threw a cherry bomb at the bathroom door. In high school in Kansas City, she studied karate, loved Bruce Lee and even painted a poster of him on her wall. She served in the Navy for four years, and afterward became a security guard at the World Trade Center. When a supervisor taunted her by saying she was too weak to work as a firefighter, she took up his challenge and passed the qualifying exams to become a New York City firefighter. She also had a studious side, receiving a bachelor's degree in English and philosophy from Hunter College. "Her apartment was filled with books," said her sister, Barbara Haynes. "She had a thirst for knowledge. She read everything. I called her the professional college student. And this was a child that at one time did not want to go to school." Ms. Haynes was surprised at how many people packed the memorial service. "Several people said my sister helped save their lives," she said. "One friend said the last time he saw Denny she was holding a door open with a fireman. Knowing my sister, she had this take-charge attitude that she had to help other people get out." Unlike many others, Barbara Haynes arrived yesterday certain that her sister was dead. 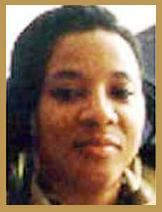 The night before, around midnight, a few police officers knocked on the door of her hotel room and told Haynes that they had identified the remains of her sister, Denease Conley, a 44-year-old security guard helping others escape from the Twin Towers. "Until that moment, we still had hope," Haynes said. "You never know. Miracles happen." If anyone from her family reads this, please know I saw Denease directing people out of the building. She died helping others. Please know that I remember and pray for her family. God Bless and Rest in Peace Denease. Denny (Denease) Conley was one of my dearest friends. She worked so hard--before 9/11, she had recently finished her degree at Hunter College and worked as a security guard to support herself as she worked towards her dream of becoming a lawyer. Her post in the World Trade Center was the lobby; she was last seen helping people get out of the dark and slippery stairs. Denny was a very spiritual person and I know that she made a choice to help others even at risk to herself; she had great courage. Perhaps Denny's stint in the military helped her to focus and face danger to save lives on 9/11. But her spritual strength was a main part of her life and a great help to me when I faced difficulty. Denny was honest, outspoken, funny, and amazingly kind and helpful. I am so glad I saw her when I visited New York in March 2001 (I had moved to the Midwest). I can still see her smiling as she crossed Flatbush Avenue in Brooklyn on that drizzly day. Her courage still motivates me as much as I am devastated by her death. I know she is at peace and could not have lived with herself if she had left the WTC without helping as many people as possible. The firefighters, security guards, family from Missouri, and friends who came to her memorial service in Brooklyn the first week in October, 2001 (Denny had been listed as 'missing' for a few weeks) all made clear how much she meant to all of us. So now you've met Denease Conley, a beautiful and brave woman who just happens to have been in the wrong place at the wrong time - unless you were one of the people she saved. I'll never know how painful it is to have lost a loved one to this tragic event, but I do know that she is without a doubt one of those true heroes I've been reading about since that terrible day. In addition to my regular readers, I would like to invite anyone who knew Denny to leave a comment here and share a memory with all of us. As well, please take the time to stop by this site and visit some of the other 3000+ blogs who are also honoring victims at this very moment. Thank you, Denease, for your kind heart and bravery in the face of unimaginable circumstances. This world is a better place because you were in it. Rest in peace. That was beautifully written for a beautiful soul. I just don't understand a world where a kind, beautiful soul like Denease gets murdered in a terrorist attack and the idiot who claimed to kill Jon Benet Ramsey in order to get attention will live to be 90 years old. Can we all agree to honor Denease's memory by doing a few random acts of kindness this week? Goodness will always win over evil. Love always bats last. Well written. She was a hero to many. Wonderful stuff. I'm glad to be a part of this project and I want to thank you again for alerting your readers to it over the summer. What a beautiful memorial. I honored Michael Haub, another hero from that day. Five years later and it still hurts! Thank you for honoring a fallen hero. Someone who gave her life to save others. Vey moving tribute you wrote. PLease stop by to read my tribute for Gilbert and leave a link and comment so that others can come here to read. I echo many of the same thoughts that have posted before me. You've written a wonderful tribute to an ordinary woman who did extraordinary things by helping save lives that might have been lost. what a brave and honorable woman. It saddens me to see the waste and loss to the families and friends of these fine people. I know that her family would be moved by your touching tribute. My tribute is for a FDNY firefighter named Durrell Pearsall, please drop by and visit. That was beautifully done! My tribute is to Teresa Martin, a DA civilian. But I also hold tribute to a close friend that was killed in Afghanistan and to all my fellow soldiers around the world for fighting for us. I'm a vet, but my husband is in Afghanistan right now, so it really hits home. It is a hard day for us, even harder for my eldest son, because it is his birthday as well. What a wonderful tribute! That's great that people were able to tell her family that they saw her helping others. Thanks for stopping by my tribute to Marjorie C. Salamone. Thank you for the links I will go and read as many as I can. Puts my little problems into perspective. And Kiki, blessings to you and your family. What a lovely tribute! Thank you for honouring Denny! The quoted comments from people that worked in the building touched my heart. A wonderful tribute to a true hero. That was hard. But I thank you. That was beautiful. Such a brave woman, and such a loss. My tribute is up at Miss Cellania. You have written a wonderful tribute about Denease (Denny) Conley. She sounds like a woman who loved life and was up for every challenge. What a hero that she stayed to help others escape on that awful day. Thank you for your exceptional words about a true American. Visit my site to read about Catherine A. Nardella who, like Denny, died too young, too soon. I feel privileged to participate in the 2996 project. "and to get her out, Denny, as she was known, threw a cherry bomb at the bathroom door." She sounds like the type to go down fighting. Thank you for allowing me to get to know a bit of her. Very well done. You did an excellent job, Harp Man. I feel like I know Denease now. I'll think of her when I think of 9/11. VERY very nice...I have posted a tribute also. Thank you for that wonderful tribute! A true hero she was! I was so impressed by her story! Her family would be proud to read this. I would never have known about her at all, had it not been for each of us to took the time to research their lives. It is wonderful to finally put a face and a name to the date, instead of that image of the burning buildings and plane crashes. A beautiful tribute. We lost so many beautiful souls that day. Please read my tribute to Major Dwayne Williams, who was lost at the Pentagon. This process has introduced me to some amazing people - some with us and some not. terrific! I am so proud to be part of this project with people like you. By remembering each one, and praying for their families we gain humanity and fight insanity. God Bless you and all the 2996ers for your efforts here. We will never forget! Thank you for sharing Denease's story with us. When I joined this project I didn't realize how moving and wonderful it would be. Please come learn about my person, Robert J. DeAngelis. to a wonderful woman who sacrificed her life to help others. thank you for the tribute. I honor Lt. Col. Johnson today. Thanks Harmonica Man. I think I heard about this project through you, and am glad to have been a part of it. The test of a persons true courage is what they would do if they knew it would never be found out. Denease passed the test! You've done a wonderful job in your tribute for such a brave person. Here is my tribute to Richard G. Catarelli. What a beautiful tribute you wrote. It brought tears to my eyes!!! I am so proud to be your Mom!! There are many, many stories of courage out there today. Beautiful job. Thank you for sharing Denease with us. What a lovely person she was. I hope that her family and friends have many beautiful memories of her to share and comfort them. Thank you, HM, for your touching tribute. Denease and those like her have inspired me today. Along with others, I remember Jeffrey Earle LeVeen. You pass ordinary Americans on the street never realizing how courageous and extraordinary they are. This was a remarkable woman and a great tribute to her. Thank you. the picture of her sister is very touching. Thank you for your beautiful tribute for Denny. A remarkable woman who gave her life to help others. Even though it was 7 years ago, i still get emotional. I reflect and think about the woman who taught me how to ride a bike, and made sure that i knew right from wrong. I thank you Denny for caring for me and always trying to make my life better. I will always remember your contagious laugh and warmth. I am so glad that god sent you to be in my life as my godmother, i truly miss you. cemera - Thank you so much for leaving that beautiful sentiment today. I'm always happy when someone finds this post and can be reminded of how special a person Denease was. Bless you on this day of remembering. I had just gotten to know Denny. She truly was a beautiful person. I wish I had more time to get to know her better. Thank you for such a perfect memorial.Rest In Peace. 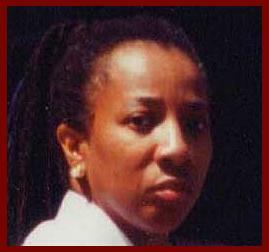 Thank you for your tribute of my sister Denease Conley, but unfortunately the video footage that you have IS NOT MY SISTER DENEASE CONLEY! However she was truly a survivor and a kind and loving person, who was always willing to help, if she could. I am not sure who to direct this too. In the previous comment from my mother regarding the video footage from "Amazing Grace,TX". 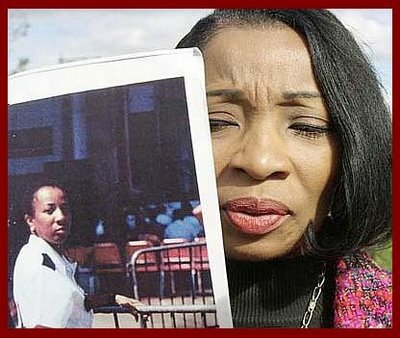 The security officer shown in the video was not my Aunt Denease Conely. The last know footage of my aunt is featured in the "Inside 911" footage by National Geographic. It's about 2 sec. long and it shows my aunt holding the door open for the first team of fire fighters that entered World Trade Center One. I just wanted to let you know. I am other wise very pleased to have found this site and the wonderful tributes to my aunt. My aunt Denny was the epitome of a heroine.. to know that I am not the only one who vaules and misses her dearly is touching in every way. Thank you for your clarification that I had the wrong video clip attached. I have now removed it. Denease has been an inspiration to me ever since I wrote this story in 2006. I was honored to have the opportunity to give tribute to such a brave and wonderful person. If either of you has links to other footage or tributes to Denease, please let me know and I will include them here. My personal email can be found in the blue cloud picture on my sidebar. Thank you both for stopping by. That means a lot to me. I Will forever miss you, its every day i think you about you, Rest In Peace, My deepest Condolence to the family my friends of Denease Conley! Denny was my friend. We met in Paralegal School. We spoke on the phone the night before. Her death devasated me. I asked God why would he have me meet her only to lose her so soon. I asked her what to do, how to go on and she told me in spirit, in that southern twang of hers, "Just live girl." I think of her often and more so on September 11th. I just wanted to tell you that ever since my scholarly research project on French cinema after 9/11, I always wondered who the woman holding the door for the firefighters may be. Was she a mother? Did she ever make it home? Did she call her family during the event? Those were questions I asked myself. I am glad I have identified who she is. This shows what the power of a few seconds of footage can produce on a stranger. You must be proud of Denease. I was watching the footage of Denease holding the door for the firemen and I said to myself that was brave of her. I wanted to know who she was. God bless her.